Heat 2 tablespoons of oil in a large skillet. Fry the softened peppers for a minute on each side on high heat until fragrant. Remove from heat. Leave the leftover oil in the skillet and remove from heat. Transfer peppers to a blender. Add broth and puree until smooth. Reheat oil in the skillet and saute bell pepper, 1/2 of the diced white onion, half of the minced garlic, diced tomatoes, and 1/2 tablespoon Mexican oregano until the onions are soft. Add pepper puree and continue cooking for another minute or two. Season with salt to taste and set aside. Heat one tablespoon of oil in a large skillet. Saute the remaining onion, garlic, tomatoes, and squash until the squash begins to soften, about two minutes. Add remaining oregano, cumin, textured vegetable protein, and pinto beans to the vegetable saute. Cook for an additional two minutes and season with salt to taste. Coat a large baking pan with cooking spray. Add 1/2 a cup of the prepared enchilada sauce to the bottom of the pan and spread evenly. Fill corn tortillas with about a 1/2 cup of filling and roll tightly. 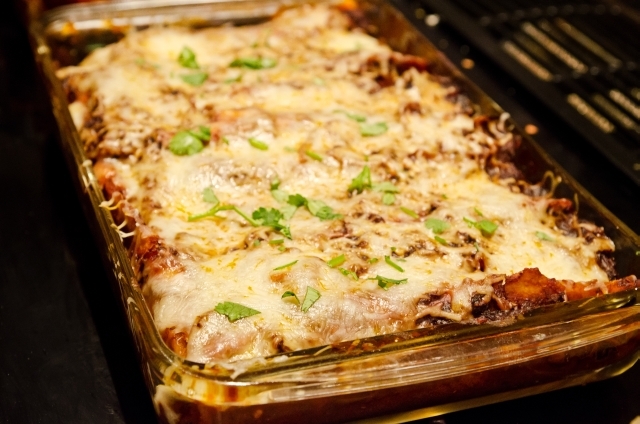 Pack the pan densely with rolled enchiladas then top with the remaining enchilada sauce and cheese. Bake at 400 degrees Fahrenheit until the sauce bubbles and the cheese is thoroughly melted, about 20 minutes. Remove from oven and allow to cool for 10-15 minutes before serving.